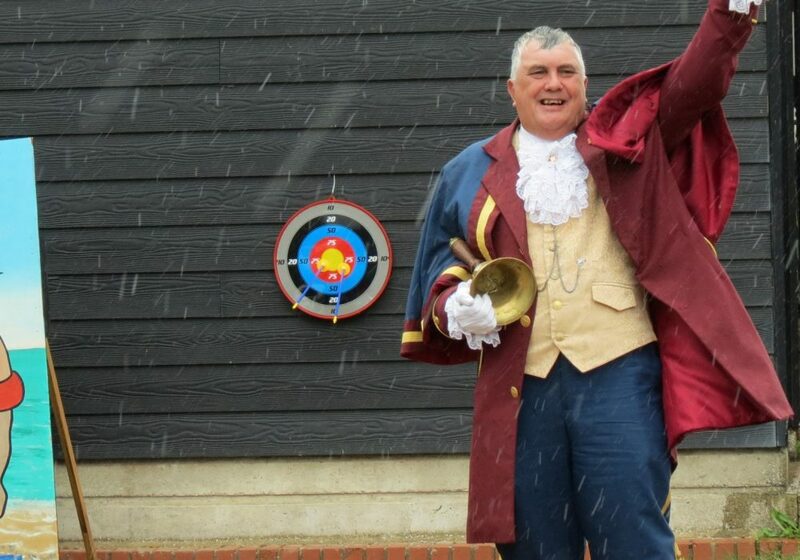 Open Day … Wet & Windy but Not a Wash Out! Well, the bank holiday weekend just flew by – quite literally with gusts of up to 40 mph around the coast! 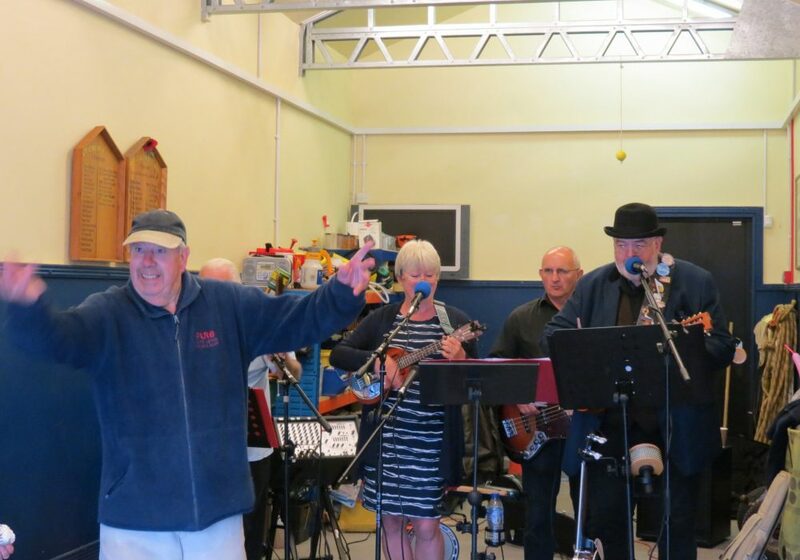 And with it came our Open Day on Sunday 26th August 2018. 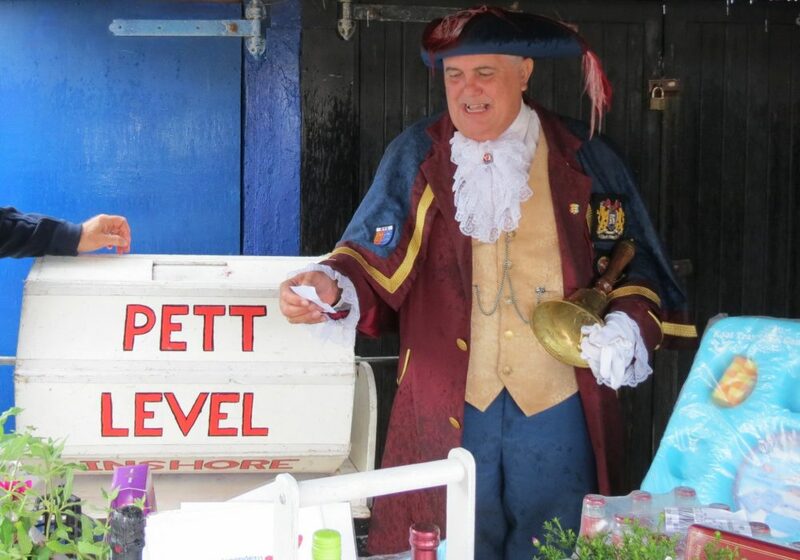 Special thanks for entertainment go to Hall and Blokes who managed to keep things lively with some great musical entertainment, and to Rye Town Crier Paul Goring for coming along, adding his voice to the event and drawing the grand raffle for us. The raffle included gifts and donations from many of our supporters. 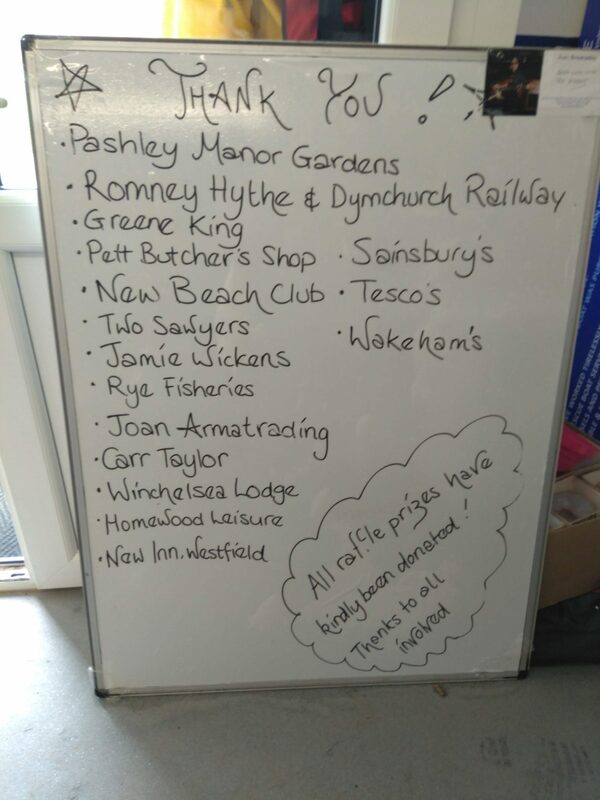 Overall, there are far too many people to thank for the day than there’s space here, so please take a peep at our Thank You board which was out on the day (tied securely to the railings, so the wind couldn’t remove it). Our Sponsors and Donors page is currently under construction and will offer a full list of local businesses and individuals who are helping to keep us afloat – link to be added shortly. There’s now also a gallery page dedicated to Open Day – click here if you’d like to see more images of the event (and the rain)! 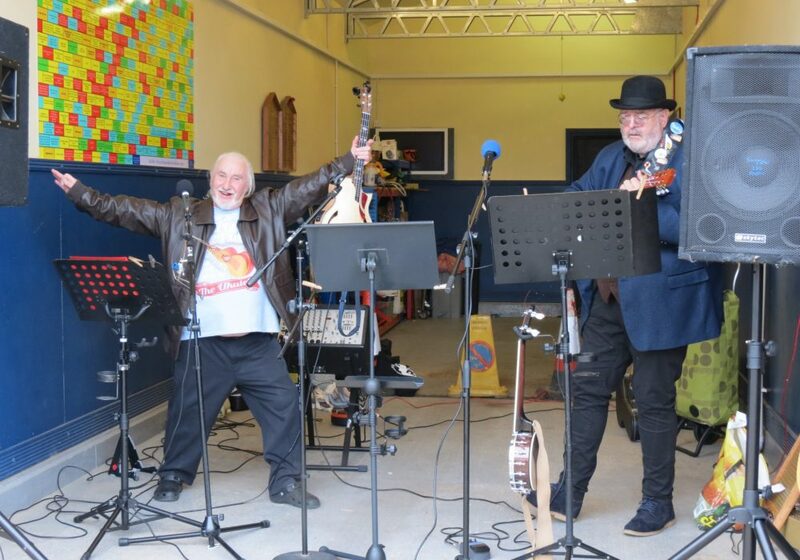 We haven’t finished all of the accounts for the day yet, but a preliminary count-up indicates that we’ve managed to achieve over £1,000 in funds raised, which is amazing considering the weather conditions. We really couldn’t have done it without all of the support we’ve received ~ thank you all very much! And of course as the count up ends, the count down to next year begins. Watch this space for further updates and a huge thank you once again to everyone who’s helping to support us as we support the coastal community and its visitors. 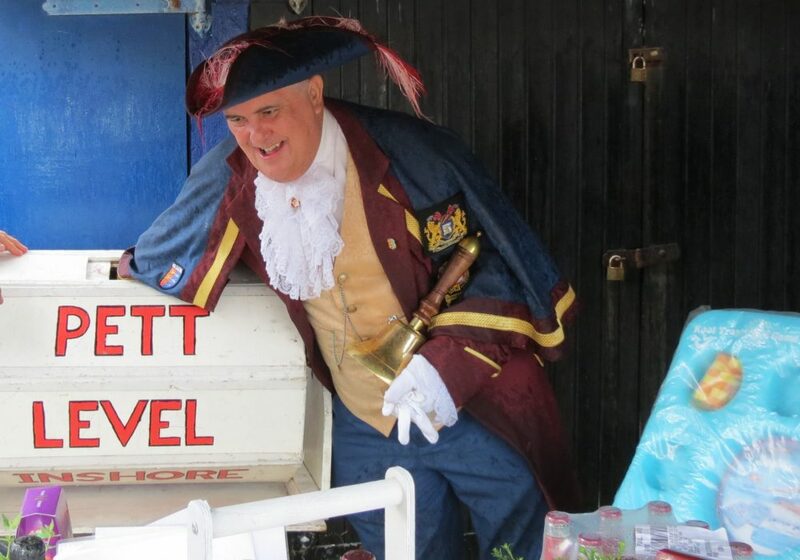 Some of the entertainment will be provided by Hall and Blokes Ukulele band and we’ve just had news that Rye Town Crier, Paul Goring, is hoping to make a guest appearance during the afternoon. 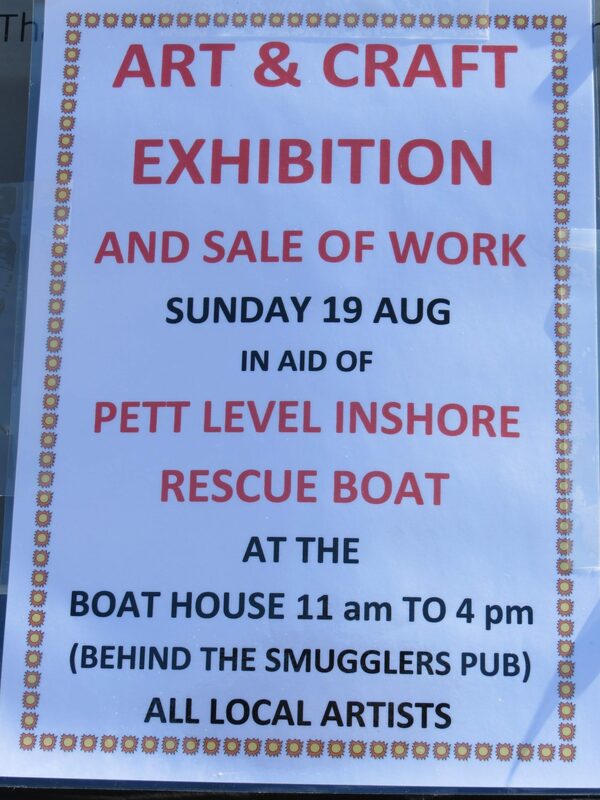 Everyone involved in the Pett Level Rescue Boat is working hard to help with preparations and you can help too by letting your friends and family know about the event and by coming along to support us. 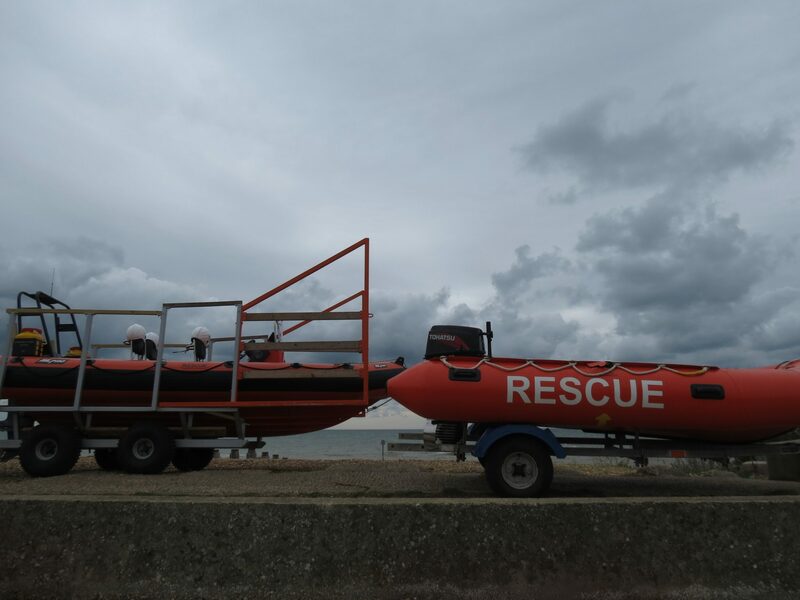 We’re an independent rescue boat and meet our own costs through constant fundraising, so all support is appreciated. We’re down at the boathouse every Sunday morning and any donations of tombola prizes – particularly bottles – are still being gratefully received. Keep an eye on the website and our Facebook page for further updates but in the meantime, we’re looking forward to seeing you on the day! Just a quick heads up about an extra diary date! An arts fundraising event here at the Pett Level Independent Rescue Boat house on Sunday 19th August 2018. From 11 a.m. until 4 p.m there’s the opportunity to review some beautiful arts and crafts, many of which will be for sale. We’re extremely grateful to be hosting this fundraising event and both the PLIRB and the local artists presenting their work will be glad to see as many visitors as possible on the day. Look forward to seeing you then! 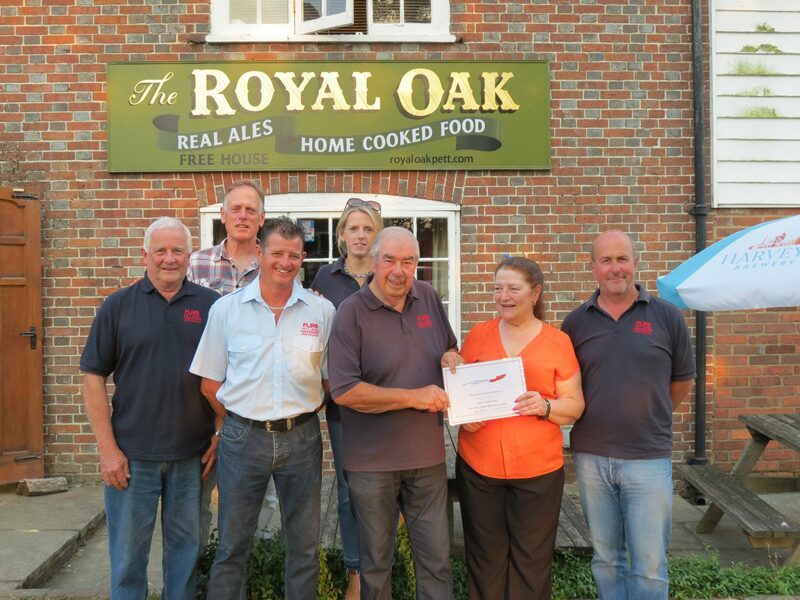 We had a busy evening on Wednesday 5th July 2018 … with some of the base and land crew off to visit the lovely staff of The Royal Oak, Pett to present a certificate of thanks for the kind donations made from bar collections. Ian Mitchell, owner of the Royal Oak, was unavoidably detained over at sister hostelry The Queen’s Head but Sally, in charge of operations at the Royal Oak in his stead, kindly stepped up to do the honours and receive the Certificate of Thanks from David Martin, on behalf of the Pett Level Independent Rescue Boat. It was such a joy to be able to stand in the delightful garden of the Royal Oak on this wonderful, warm evening to take the photo. If you haven’t experienced a drink and a meal here it’s highly recommended, particularly in this run of fine weather we’re having! 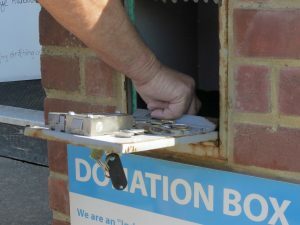 Many thanks to all concerned, including regulars and visitors to the Royal Oak who kindly drop their change into the collection box, or make a point of popping a note in as a contribution. 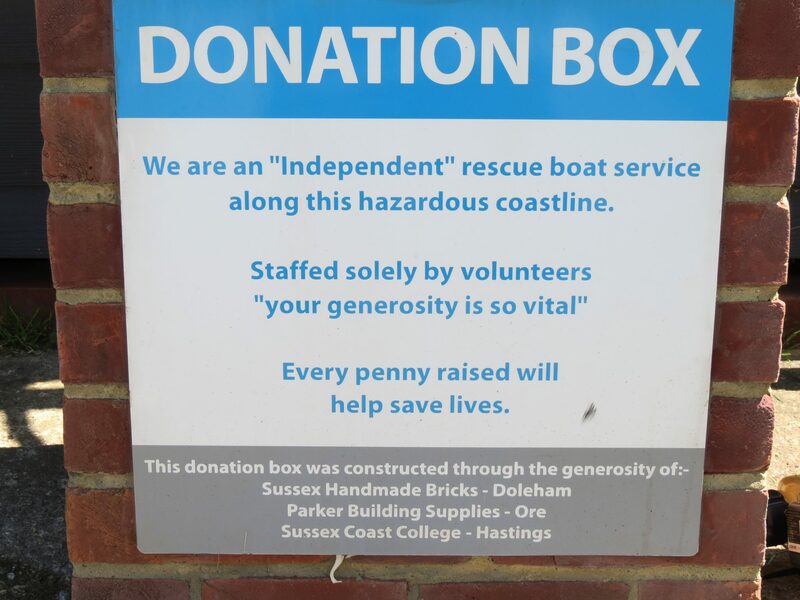 As a charity, the Pett Level Independent Rescue Boat team really appreciate this kind of of generosity and it’s vital for helping keep us afloat (in all ways). Open Day plans are all underway and some of the crew are just so full of anticipation and excitement that there’s no holding them back. 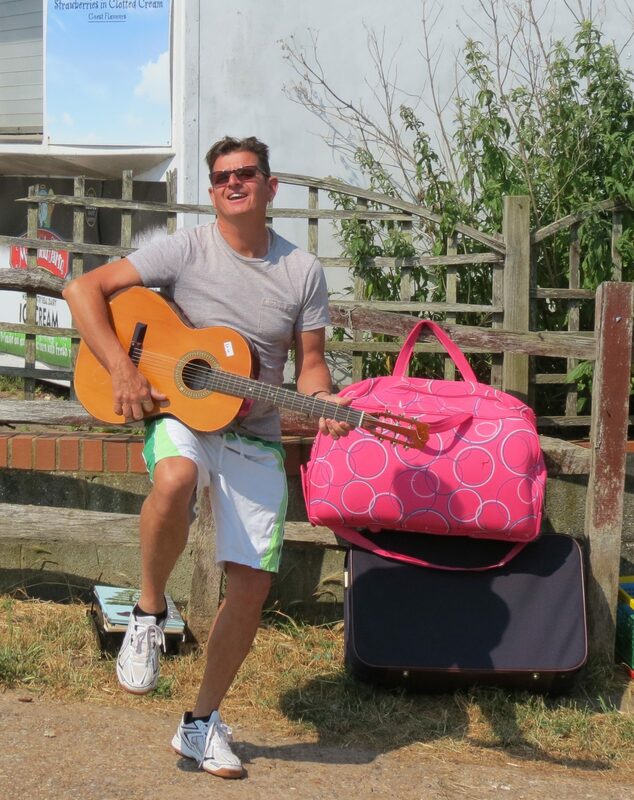 Check out our entertainment poster boy Shaun, who kept us all entertained in the sunshine this weekend with a very laid back rendition of Mull Of Kintyre (hmmm, we have no idea why either)! For this, and much better more entertainment, please come and support us on Open Day, Sunday 26th August 2018. See our dedicated Open Day page for more details. 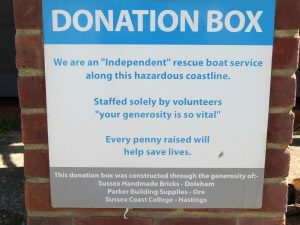 As well as crew training last Sunday, 3rd June 2018, there was also a bit of work to do on the donations front. 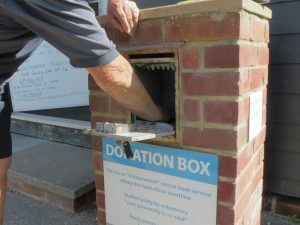 Our base donation box, kindly built by students of Sussex Coast College, using materials donated by Sussex Handmade Bricks, Doleham and Parker Building Supplies, Ore.
Then there was a trip up to Fairlight Village to say thank you to the owners, Graeme and Leoni Gambrell as their recently emptied collection point has meant that a generous donation has been made to us. Members of the crew and committee popped up to pay a visit and present them with a certificate of appreciation for their efforts. 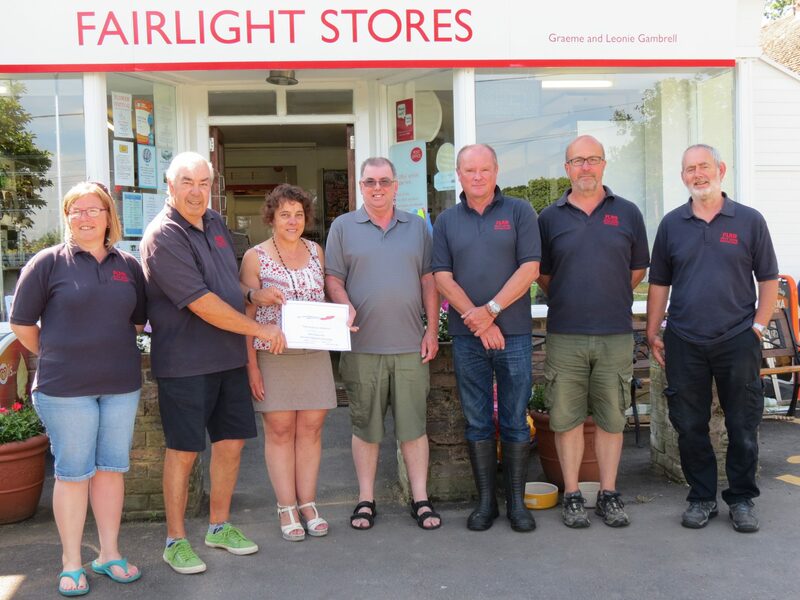 Many thanks to staff and customers of Fairlight Stores, for their generous donations at the store’s collection point. 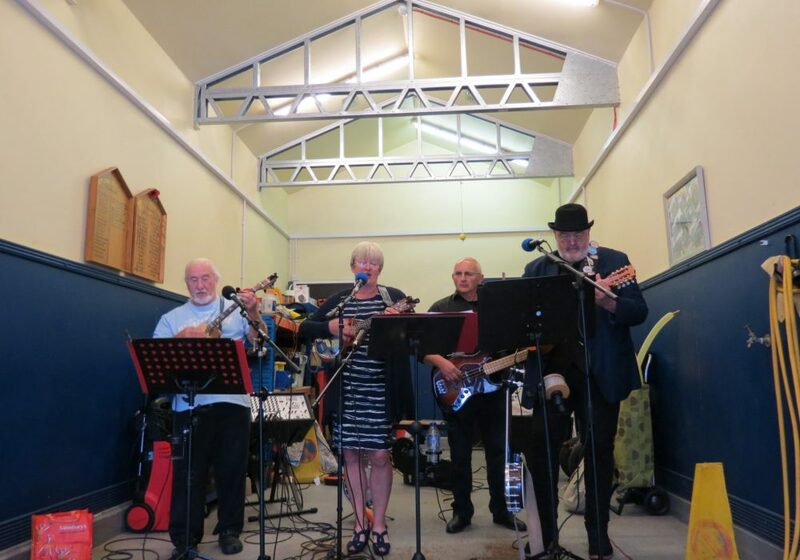 From left, Jo Barry, David Martin, Leoni and Graeme Gambrell, Mark Hall, Steve Hill and Andy Cromton. As an independent rescue service and charity, we do reply on donations to keep us afloat, so thank you to everyone who has donated directly into our collection point at base and at Fairlight Village stores, your generosity is much appreciated.